Top 10 rankings in search engines for Chemical manufacturing company in Canada. Multi-Blend Ltd., is a Canadian company, founded in 1987, manufacturing chemical maintenance products for the Industrial and Institutional market. Multiblend.com were not in rankings in any search engines for any keyphrases, when they contacted Creative Web Promotion. Their goal was to get as much traffic and inquiries for thier products and services in Canada. Thier website was dynamic website designed in Aspx with flash content on homepage. Since the client had no idea with SEO, so our SEO team suggested Brother.In the list of keyphrases which would get them enquiries online. We generally work on extra keyphrases when contract is for 25, so that client benefits for maximum out of his investment. Since the web pages were not getting indexed by search engine spiders, the chances of ranking for keywords targeted on those pages was very small. So the first part of the solution was to build out the SEO friendly pages, so that pages would get indexed by search engine spiders. In addition, we added keyword-rich content at the proper density levels to each of the pages. Of course, Creative Web Promotion then completed a themed optimization of each of the pages. Since client had no idea with SEO, so our SEO team suggested Brother.in list of keyphrases which would get them enquiries online. We generally work on extra keyphrases when contract is for 25, so that client benefits for maximum out of his investment. Since the web pages were not getting indexed by search engine spiders, the chances of ranking for keywords targeted on those pages was very small. So the first part of the solution was to build out the SEO friendly pages, so that pages would get indexed by search engine spiders. In addition, we added keyword-rich content at the proper density levels to each of the pages. Of course, Creative Web Promotion then completed a themed optimization of each of the pages. This client is extremely pleased with the results of the campaign. 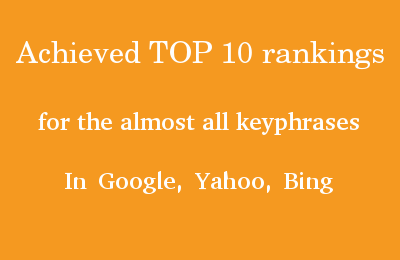 They have achieved TOP 10 rankings for the almost all keyphrases in Google, Yahoo, Bing.